Hands down one of my favorite foods is carnitas, and since I developed my allergy several years ago it is one food that I have not been able to eat. Typically carnitas are cooked with cayenne and chili pepper -- a big NO NO for anyone with nightshade allergies. That's why I avoided them like the plague. Well, as you know, I am a Texas girl, and Tex-Mex food is part of my heritage, so I decided I would make my own version of this yummy dish! I should have done it much sooner. We are going to speed up the cooking process, so we'll be cooking in the oven. Set your oven to 300 degrees. Place the pork shoulder roast in a large oven-proof pan. Add 1/2 cup of raw apple cider vinegar with the mother over the pork. I added a small amount of water as well, just enough that the sides of the pork was submerged in water. I did not submerge the top. Sprinkle a generous amount of salt, pepper and garlic over the top of the pork. Cover the top of the pork with cummin. Place a lid on the pan and place in the oven. Cook for 2 hours, or until the pork is fall apart tender. Remove the pork to a large bowl and shred it. Chop a handful of cilantro and add it to the shredded pork. Add 1/4 cup of lime juice over the pork and toss it. Make sure the pork is completely covered with the cilantro and lime. Serve in corn tortillas with diced onion, sour cream and guacamole. Cut the avocadoes into chunks and place in a bowl. Add 1/2 cup of chopped onions, a handful of chopped cilantro, and stir. Squirt the top of the mixture with lime juice and salt to taste. 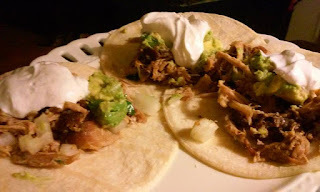 How do you make your nightshade free and gluten free carnitas?